Tools To Create A New Year’s Resolution That Will Last Forever! New Year’s is most aligned with New Year’s Resolutions. It seems to be the most common time of year where people attempt to create a new habit. Sometimes, over a decade goes by where we try and create the same habit over and over again. We tell ourselves we are going to work out more, eat healthier, lose weight, or quit smoking. We have the best intentions of making our New Year’s wishes our reality but we fall short the majority of the time! The reason they do not work is that we depend solely on “desire” to manifest our New Year’s Resolution! But to create an effective habit it takes much more than desire. We must utilize the integration of skills, knowledge, and desire. What do you desire for this New Year? It takes an entire year to develop the right skills and the right knowledge to effectively implement a habit. For this year, why not let us all create an accumulative effect in our lives (or effective habit) that will last more than a few weeks and be applicable for all that we desire? 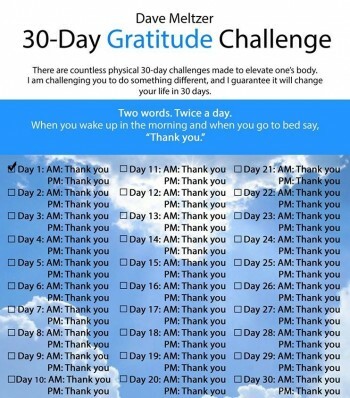 That is why I am launching the David Meltzer <a href="http://www.meltzermission our website.com/tis-the-season-part-iii-gratitude/” target=”_blank”>Gratitude app with the 30 Day Gratitude Challenge built in. Every day is a new year when we are grateful. We must say “thank you” as much as possible, but especially we must create a habit of saying “thank you” twice a day… once when we wake up and once when we go to bed. If we make saying “thank you” our habit not only will we program our conscious but our subconscious, and eventually it will be etched in our unconscious and become part of our true self. We will be happy and grateful with a positive perspective. This is what will allow us to manifest everything we desire! Losing weight, getting into shape, eating right, and quitting smoking; whatever we desire will be ours with this habit of saying two simple words. Let that be our New Year’s Resolution! Join us, with the Gratitude App, to remind ourselves to say “thank you” twice a day and allow us to say “thank you” to everyone who fosters our personal and professional growth. For this New Year, I wish upon all my great friends these two fantastic words. Thank you! You can click here to sign up for announcements on the launch of the Gratitude App!